Albedo hut vilage after weekend workshop. 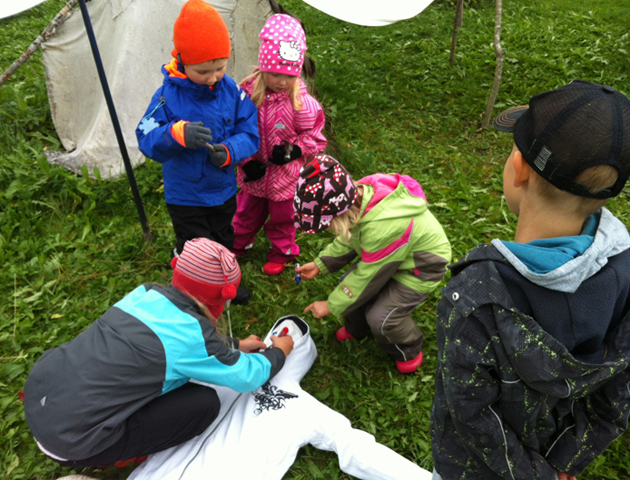 Johanna, Onni, Helmi, Iita and Jiri making the albedo scarecrow. Albedo field cover in making. Albedo tent making by Jonna, Vilma, Viivi and Johanna. 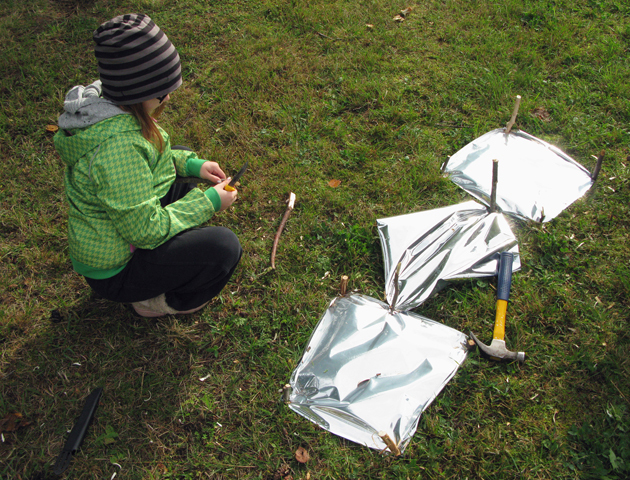 Mari Keski-Korsu’s DIY geoengineering project Albedo Dreams occured in Children Cultural Centre Lastu in Lapinlahti, Finland as a workshop for children 21. – 22.9.2013. In Albedo and Architecture -workshop, white and light buildings were constructed and the intention was to reflect solar energy back to space in order to mitigate climate change. The work spread everywhere in Lapinlahti village the next week when everyone is challenged to whiten their environments. Lapinlahti people were able to participate by covering anything they can think of with white linen, folio, light paint or other white materials. The impacts of the whitening actions are evaluated by Nea Kuusinen and Frank Berninger from Helsinki University. Albedo is a measure unit that tells the reflection power of a surface. It is expressed from zero (no reflection, black) to 1 (perfect reflection, white). It has been stated that if reflecting materials would be used on roofs and pavements in urban areas all over the world, the amount of CO2 emissions would be lessened as much as if all the cars of the world would be taken off the roads for 50 years (Concordia University, 2012). Still, it is believed that even though there is an affect, it is not big enough. This is why Albedo Dreams wants to raise an important question trough play: should we still try other methods than trying to trick our way from the problem by doing geoengineering? Should we just save energy for example? The workshop was organised in context of ANTI Contemporary Art Festival 24. – 29.9.2013. ANTI is concentrated on live and location based art as well as performance. 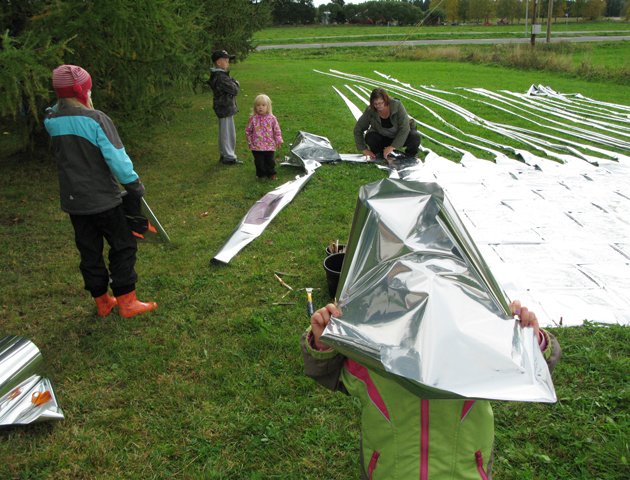 It spread around Kuopio town occupying public spaces, including seminars about the festival theme ‘warmth’: ecology and sustainable development and urban space. Albedo Dreams happened also in urban spaces of Kuopio during the festival. 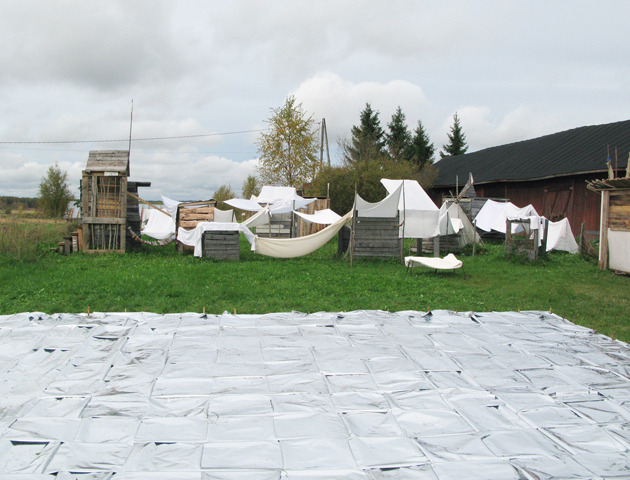 There was Albedo linen experiment in Satamapuisto at 13 – 14 and Albedo LENTOHÄRVELI workshop in Kuopionlahti park. The time of the whitening, size of the whitened area as well as location and weather are taken into consideration when the affects of whitening actions are calculated. The change in the energy staying on Earth is calculated in megajoules. To make the affect more understandable, the megajoules are converted into gasoline liters. One liter of gasoline is 42,4MJ. Kuopionlahti park, Kuopio 1/8 day, 10 m2: 3 MJ.